Cooking Pork until the center of the cut was white, dry and tasteless was a myth. USDA announced that 160 degrees (until now the official proper internal cooking temperature for pork) was overkill. 145 Degrees is now the preferred minimum temperature. I’ve always had a foolproof and succulent method of grilling pork chops, and ALWAYS cooked them until slightly pink in the center. The ten minutes after removing them from the grill (resting) is when the internal temp continued to increase, leaving my pork chops tender, juicy and safely cooked. The USDA explains the change in temperature like this: Trichinosis is the parasitic disease cause by eating undercooked or raw meat infected with roundworm larvae. Once common, roundworm has all but been eliminated from commercially grown meats. But Salmonella was the real pork concern. Salmonella sits and covers the outside of the raw flesh but cannot reach the interior or the muscle. So, when the internal temperature of your pork is 145 degrees, the exterior is plenty hot enough to kill the Salmonella bacteria. But ground meat and pork hasn’t changed. Because it’s ground up, the interior of the product contains meat EXTERIORS. Grinding mixes the bacteria into the meat, so it’s a good idea to thoroughly cook ground meats to 160. 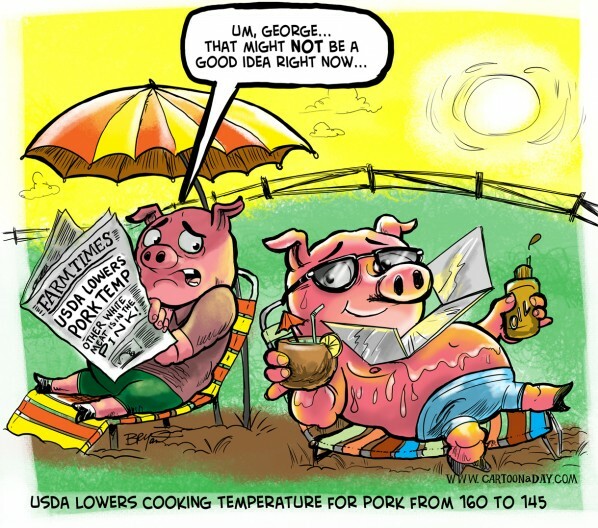 Inspiration: Cartoon pigs sunbathe on the Farm just as the USDA announces a lower temperature for safely cooked pork. The pigs are in trouble.